BEADED CRAFTSMANSHIP AT IT'S BEST! 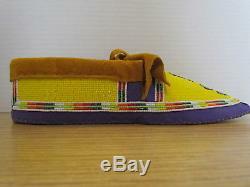 THIS IS A STUNNING PAIR OF AUTHENTIC HANDMADE BEADED MOCCASINS, 11 INCHES FROM HEEL TO TOE AND 3.5 INCHES WIDE. 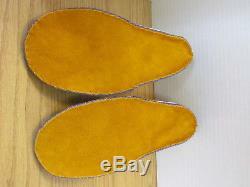 THEY ARE MADE WITH TANNED MOOSE HIDE LEATHER AND DURABLE FABRIC. 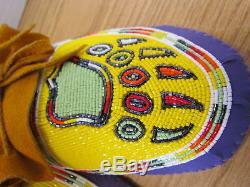 STUNNING BEADWORK STITCHED BY HAND PORTRAYS A TRADITIONAL BEAR CLAW DESIGN. THE BEADWORK IS YELLOW WITH LIGHT GREEN, ORANGE, RED, AND WHITE ACCENTS... HAND MADE IN NORTHERN SASKATCHEWAN BY A TRADITIONAL CREE NATIVE AMERICAN ARTISAN. This pair of moccasin, as with all my products, are handmade here in Canada by an authentic Native American (Morin of the Woodland Cree Nation). These are guaranteed to keep your feet toasty warm and provide great traction on all surfaces around the house. By purchasing these moccasins you are directly aiding the preservation of the original craftsmanship in North America and keeping Native American roots alive. 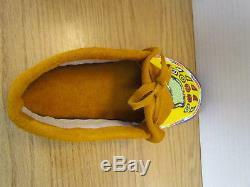 Any style of moccasin I carry is unique to the individual crafts person. I also carry tanned moose hides, birch bark biting art, jingle dresses and much much more. 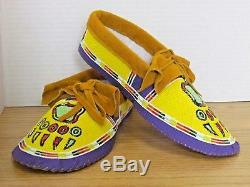 BEFORE YOU ORDER, MAKE SURE YOU MEASURE YOUR FOOT FROM HEEL TO TOE IN INCHES TO SEE IF THE MOCCASINS WILL FIT. 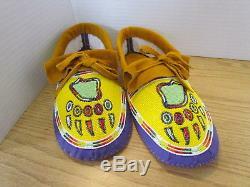 The item "STUNNING BEAR CLAW FULL BEAD MOCCASINS, YELLOW MULTICOLOR 11 INCHES, HAND MADE" is in sale since Monday, September 18, 2017. 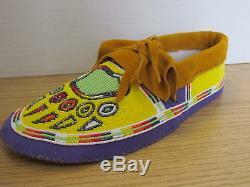 This item is in the category "Clothing, Shoes & Accessories\World & Traditional Clothing\Native American". The seller is "schmm" and is located in Prince Albert, Saskatchewan.